The Generation Business designs innovative and participative planning processes that reflect and enhance an organisation's way of working. We engage external and internal stakeholders in planning and envisioning the futures that they will help create. Recent strategic planning assignments include a review of the strategic plan for Regional Housing Services Ltd followed by skills development sessions for staff enabling them to create their own team-based operational plans and staff performance plans. 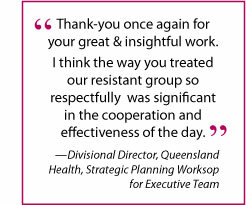 We have designed, implemented and followed up on strategic planning workshops for the executive team at Queensland Health, Gold Coast District as well as their Emergency, Critical Care and Support Unit.